If you’re a growing small business, you need to consider changing your hiring approach. I get it – hiring at a small company is tough. Successfully growing to 100 or 200 employees is certainly an accomplishment worth celebrating. But how will you get to the next 100 or 200 or 300 employees? Those small businesses on the cusp of becoming a mid-sized business need to start hiring with a mid-sized business mentality. Here are three areas where talent leaders at mid-sized businesses are thinking differently. Focus here, and you’ll continue growing your business successfully. As a small business, your top priority roles to fill are sales, business development and operations. Having quality hires in these three job functions are so critical in building a solid business foundation. Meanwhile, talent leaders at mid-sized business prioritize engineering over business development. As these organizations think about scaling to reach new customers and support its current customers, a solid online experience is key. Since 64% of talent and HR leaders at SMBs agree that that their recruiting team will likely stay the same, you’ll have to recruit smarter and prioritize job functions that will have the biggest impact on your growth. Those who aspire to grow into a small business will have to focus hiring on building out your engineering team. As you scale hiring, you don’t want to sacrifice quality. 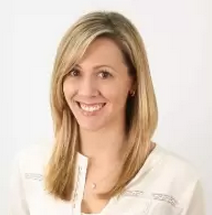 A bad hire at a mid-sized business can be just as damaging as a small business. Measure the source of your quality hires so you know where to focus your efforts. According to our research, employee referrals are a key source of quality hires for both small and mid-sized businesses. This is not a surprise, given that referred employees are faster to hire, perform better, and stay longer in the company (some of the top metrics recruiters care about). As mid-sized businesses grow faster, they tend to rely more on job boards and social networks to scale efficiently. As a small business, you pushed hard for employer branding just to make yourself known to candidates. As a mid-sized business, you’ve seen the initial successes with employer branding. 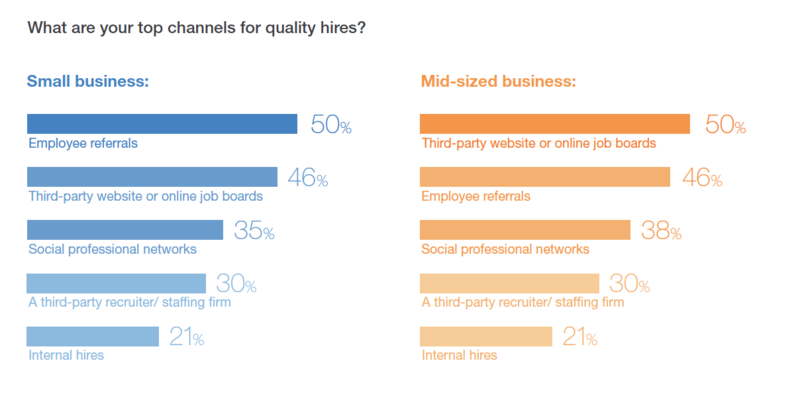 With a bit more money and trust to work with, plus the need to hire quality talent that can enrich your company culture faster, mid-sized business are more likely to diversify their employer branding channels. Mid-sized businesses focus more efforts on their company career site and job boards, likely for a couple reasons. One, they are growing and getting more awareness of their company and want to reflect the same experience as their LinkedIn and social media employer branding channels. They are also more likely to hire more entry-level talent, so they expand into campus recruiting more than they did when they were at a small business. 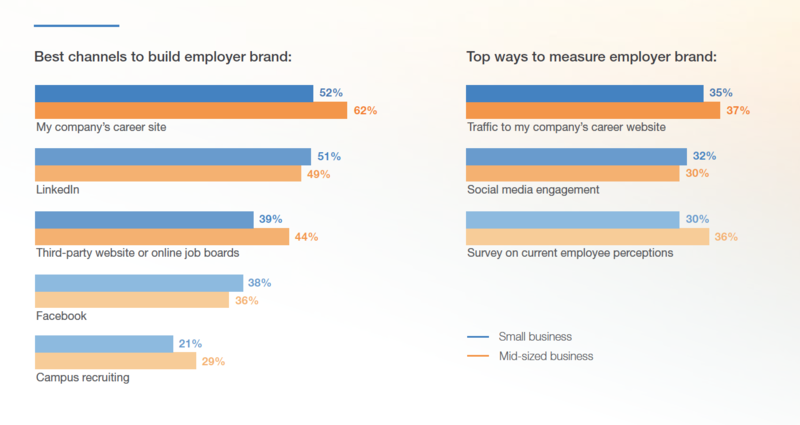 Measuring the effectiveness of employer branding is still challenging and vary based on company size. Small businesses use more web and social metrics, while mid-sized businesses look at internal survey data and best employer awards. For more insights and trends to help your small business grow, check out the 2017 Small and Mid-Sized Business Recruiting Trends report, which is filled with what’s top of mind about your peers.